Having recently finished Seattle Tilth’s Comprehensive Organic Gardening class, I’ve been busy planting with that sense of abandon and liberation that I think only comes with knowing a little bit about something. For years I’ve admired gardens and pea patch plots that seemed a bit of contained chaos, with a bush of that here and a tuft of that there in a mysterious symbiosis. There was something going on but it was a secret, at least to me.Â So this year I buckled down and spent a few Thursday evenings and Saturday days getting schooled on the ways of organic gardening in Seattle. And that lovely little bed is most definitely a product of that learning. In raised beds past, I grew one or two things in straight rows and had little faith that anything would grow, so I planted densely. But it grew and grew and grew and we found ourselves with a lot of those one or two things. 2010 was known as the year of cavolo nero. 2009 was the year of the beet. But 2011 will be a year of variety! 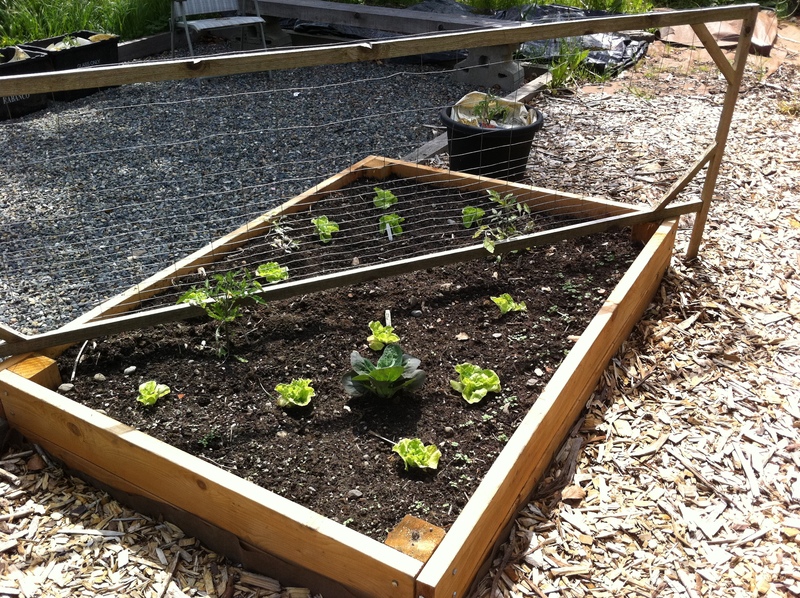 I’ve planted tomatoes, bok choy, spinach, arugula, and butter lettuce in one bed, in diagonal and diamond rows all with a strategy. As the tomatoes grow, the little butter lettuces and bok choy will be shaded from direct sun. Arugula and spinach were planted in the voids of the tiny lettuces to help retain moisture, keep weeds away, and will be harvested before crowding out the growing lettuces. Despite it being a record-cold spring, we’re eating from the garden and hope to all year long. Last night for dinner we enjoyed dumplings made primarily from home grown veggies: homegrown mustard greens, green garlic, chives, and shiitakes with store-bought tofu. I’m excited to write about the progress of the garden and the lovely things we’ll eat from it.